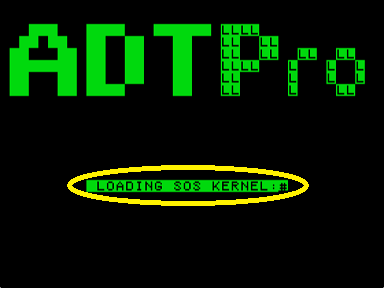 If you already use the DOS version of ADT, or an earlier version of ADTPro, you can use it to transfer the virtual floppy containing ADTPro for SOS that comes with this project (ADTPROSOS-2.0.3.DSK) to your Apple ///. Reboot with the ADTPro SOS floppy, and you're ready to go. If not... read on. If you still need to connect your host and Apple /// computers through their serial ports, refer back to the Connections section. If you'd rather have a pre-built ADTPro floppy disk for SOS arrive at your door than create one yourself, click here. Here is a 5-minute overview video of the bootstrapping process. It shows the bare-metal bootstrapping scenario of an Apple /// with a null modem cable, all the way to making a bootable ADTPro SOS floppy. While it shows version 1 of the bootstrap software, the process is largely the same with version 2. Just be sure you use the type-in program in the detailed steps below rather than the one displayed in the video. Also, you will want to receive the disk named ADTPROSOS-2.0.3.DSK since that is now the one that is specific to the Apple ///. The Apple /// doesn't have the rich set of firmware the way the Apple II does. That means that the serial port setup and communications software has to be "bootstrapped" - that is, typed in - by you, dear reader. The Apple /// does have a minimally functional command line interface, or "monitor." 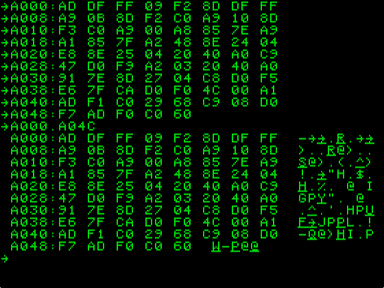 It is accessible with the familiar (to Apple IIe users) Ctrl-OpenApple-Reset key sequence. The machine will beep, and you will be presented with a blinking cursor next to an arrow prompt. You then proceed to type in and run a short bootstrap loader; clicking on Bootstrapping->SOS from the ADTPro server gives instructions for that. The bootstrap loader then waits to accept the rest of bootstrapping code from the ADTPro server, which starts flowing once you dismiss the ADTPro server dialog box. 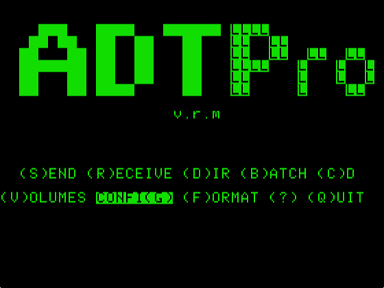 ADTPro will complete the bootstrapping process and leave you with your /// running the ADTPro client under SOS, where you can format blank disks and reconstitute software from virtual disk images. The first disk you create should, of course, be the ADTPROSOS-2.0.3.DSK disk image so you never have to type in the loader program again! Other public domain Apple /// software is available here, for example. Connect your host and Apple /// computers through their respective serial ports. It is imperative that these numbers and letters be typed in exactly and precisely as they appear above, with no errors. It will be important to review and re-check the lines before actually running it. To ensure that you never have to type this in more than once, follow all the way through to the end of this procedure to format a new floppy and receive the full, bootable ADTPro SOS disk that ships with this distribution: ADTProSOS-2.0.3.dsk. On the ADTPro server, click on the Bootstrapping->SOS menu item. You can click "Ok" on the dialog box that appears since you have just followed the same instructions and the bootstrap loader is running on the Apple /// now. The bootstrapping process should now continue without any further need for intervention. As data is sent from the ADTPro server to the Apple ///, a character will flash to the right of the status message to indicate progress. If the screen never changes or stops updating for more than a few seconds, you will want to re-check your serial connections and potentially try again. You can do that by stopping the /// with the Ctrl-OpenApple-Reset key sequence to get back to the monitor. Then. 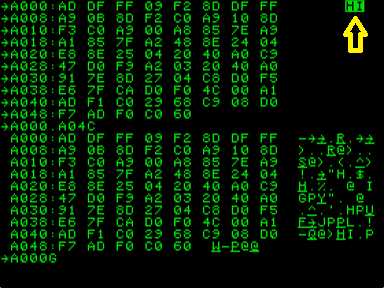 type A000G and hit Return to start over without having to re-type the initial loader program. Click on the Bootstrapping->SOS menu item and hopefully your luck will change. When it is finished, the ADTPro SOS client should be running on the Apple ///. Use the ADTPro client's format function to format a disk or two. Note that in the SOS world, formatting a disk doesn't make it bootable - it just prepares the filesystem for writing. You are now ready to receive the ADTPROSOS-2.0.3.DSK disk image from the host. Once you've done that, you've got a bootable SOS disk that contains the ADTPro client program.